édité le 05/01/2018 - Plus de news de "Larsen & Toubro" - Voir la fiche entreprise de "Larsen & Toubro"
L&T Hydrocarbon Engineering Limited (LTHE), a wholly-owned subsidiary of Larsen & Toubro, has signed an offshore contract for ‘Bassein Development 3 Well Platform & Pipeline Project’ with Oil & Natural Gas Corporation (ONGC) valued at approximately ₹ 1,483 crores (~ 229 Million USD). The order, won against International Competitive Bidding, encompasses ‘EPCIC’ – Engineering, Procurement, Construction, Installation and Commissioning - for the project. The EPCIC scope of the project includes three new wellhead platforms, 23-kilometer subsea pipeline, composite subsea power cable, clamp-on works on an existing platform and modification work on nine existing platforms in the western offshore basin in India. The project, part of ONGC’s strategy to jointly develop three small and marginal fields/blocks namely B-147, BSE-11 and NBP-E under ‘Bassein Development 3 Well Platform Project’, is scheduled to be completed by May 2019. L&T has been serving the upstream hydrocarbon sector since the early ’90s. This contract reiterates the long-term association of L&T with ONGC in the development of offshore fields in India. The Company’s offshore track record includes successful completion of several challenging projects for domestic and international clients. LTHE provides complete ‘EPCIC’ solutions for the offshore oil & gas industry combining customized engineering, procurement, fast-track project management and world-class fabrication and sea installation capabilities meeting stringent timelines, conforming to international safety standards. Larsen & Toubro is an Indian multinational engaged in technology, engineering, construction, manufacturing and financial services with over USD 17 billion in revenue. It operates in over 30 countries worldwide. A strong, customer-focused approach and the constant quest for topclass quality have enabled L&T to attain and sustain leadership in its major lines of business for over seven decades. ONGC's market capitalization as on 16 November 2017 was INR 2,310 billion (US$ 35.51 billion). During the financial year ended 31 March, 2017, ONGC Group had produced 61.60 MMT of oil and oil equivalent gas (MMTOE) (approx. 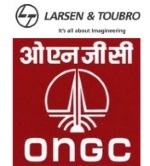 1.23 MMboe per day); the Consolidated Gross Turnover was INR 1,421 billion (US$ 21 billion) during FY’17 and total consolidated oil and gas reserves were 1,818 MMTOE as on 31 March 2017. Voir la fiche entreprise de "Larsen & Toubro"
Les dernières news de "Larsen & Toubro"